If you visited our house over the past week you’d be forgiven for thinking you’d walked into a scene of blissful domesticity: home-grown produce on the kitchen table, the smell of freshly baked bread, sewing-basket balanced on top of a pile of uniform to be named… The last few days of the summer holidays have been full of running errands and all those last-minute chores before Back To School – that time in early September when parents across the land heave a collective sigh (of regret and/or relief). My daughter had her first day at secondary school yesterday. 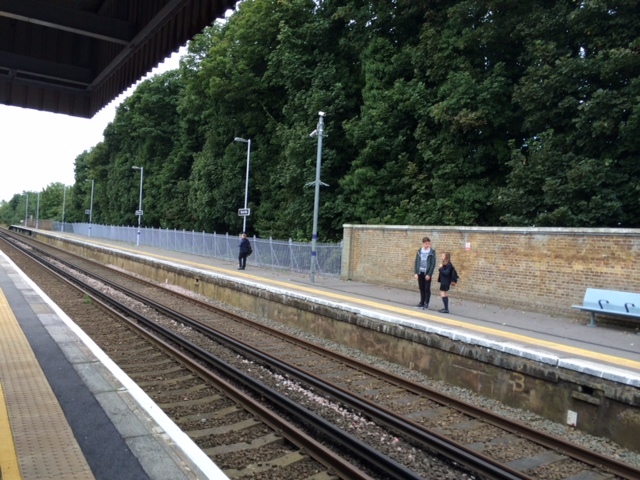 In a complete fit of magnanimity, my eldest son got up four hours earlier than he has for the previous six weeks to travel with her on the train so she knew where to go, even though he doesn’t start back until Monday. Gosh, it did feel odd waving them off – huge love, pride, anxiety, happiness, sadness, excitement, wistfulness… The whole shebang. He was back an hour later and spent the remainder of the day ‘resting’; she had a very happy first day. As well as the looming new school year, we’ve also been preparing a bumper family entry for the village gardeners’ association late summer show. My younger son entered ‘A loaf (any size/any flour)’ and has been taking every opportunity to learn from the master bread-maker in our house (my husband). Secrets have been passed from father to son and he duly baked the most magnificent bloomer yesterday evening. David entered a ‘White plaited loaf’ and was up until 3am (yes, 3am) this morning creating his masterpiece (we’d been out to see friends earlier in the evening and stayed late…). 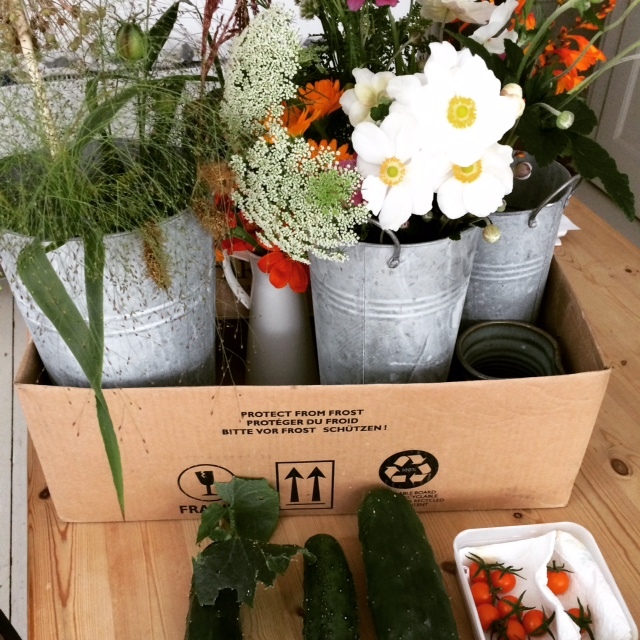 My entries were much less labour-intensive: ‘1 Cucumber’, ‘9 Cherry Tomatoes (one variety)’, ‘Cut flowers mixed or individual outdoor varieties (1 vase)’; ‘Cut grasses and/or seed heads mixed/single variety (1 vase); and ‘5 stems of Annuals’, so I was out in the garden early this morning, battling cobwebs and gathering spiders on my pyjamas, to cut my produce. My daughter entered a photograph – ‘Insect Life’ – of an ant in a flower that she took on holiday a couple of years ago. Our entries had to be at the village hall by 10am, then there was a four-hour wait to find out the results… We nipped back after lunch to see how we’d done. Ta-da! My son’s prize- (and, to his delight, cash-) winning, ginormous bloomer. 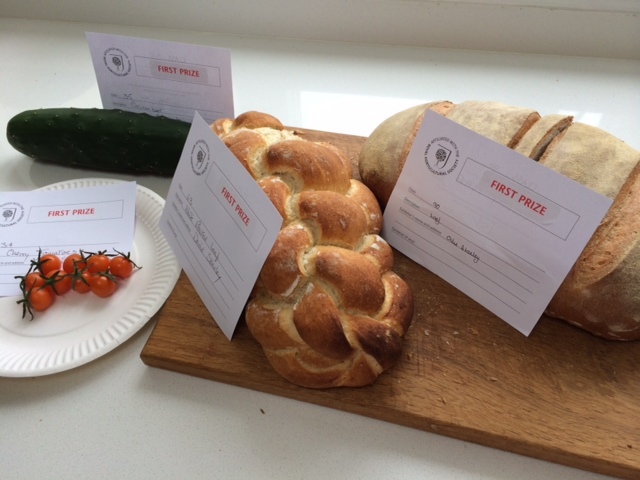 David’s late-night creation also won first prize, as did the 9 cherry tomatoes (‘Sungold’) and 1 cucumber (a monster ‘Marketmore’). 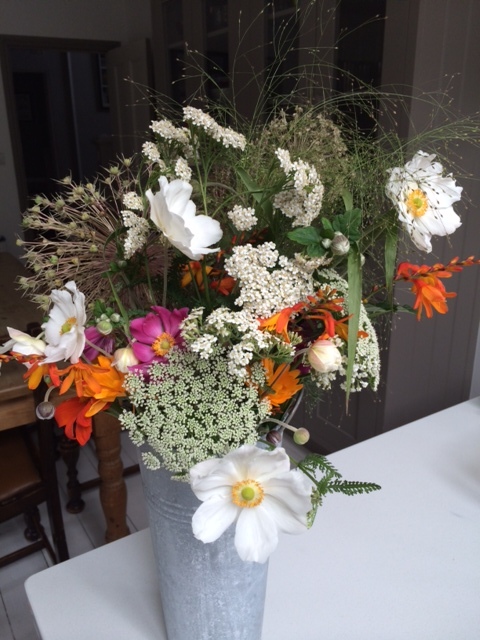 My mixed flowers and grasses/seedheads didn’t win but I am of the ‘pick and plonk’ school of arranging and there were some rather splendidly arranged vases. My ‘5 stems Annuals’ – Tithonia, of course – came second to some wonderful sunflowers, and my daughter’s photo came third. She’s looking forward to next year when she’ll be old enough to enter for the cash prize and give her brother a run for his money. Thank you CJ. My son was so buoyed up by his success that he baked a delicious carrot cake today. Lovely but no good for my waistline! Congratulations on your family’s baking triumphs! And also on raising such a good big brother. Thanks very much Jason. We’ve been eating a lot of bread! How lovely of your son to make sure your daughter got to school ok. Thank you Margaret. You should go for it! 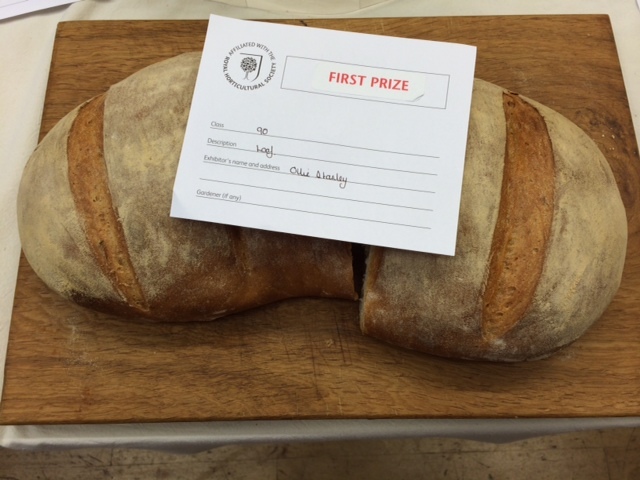 I was quietly confident when I saw the photo of The Loaf on Instagram but relieved that his industry was rewarded. I am extremely impressed with The Plait and wonder if the judges dared to cut it open or if they just admired from afar. I share your angst as you watch the daughter go off happily and independently. You have done your job too well. Commiserations. We used to love entering our local flower and produce show, especially the children because of the cash prizes. I, on the other hand, used to get ridiculously nervous picking the required number of perfect raspberries and making sure the carrot tops were cut and tied properly. The standard can be impossibly high so very well done to your two master bakers. The photo of your daughter and son told a thousand words and I do hope the new term is going well for you all. Thank you Sarah. We’re settling in to the new routine. Great packed week! I’m especially impressed by that plait – have never tried more than 3 strands myself. May be inspired to greater ambition! I love these milestone moments myself – they’re always poignant, but also another step along the way of our parenting role in helping our children towards independence – which is very different from detachment. Both our sons are now grown and independent, but both still value our input and support, and we see a lot of both of them and their lovely partners. And equally we value their support and input. Hope you have a good term ahead! Thanks Deborah. It sounds as though you got it right with your two. I hope we manage to do the same. Thank you Sarah. I’m hoping to encourage regular bread-making! Thanks so much Penny. It was indeed a relief that she had a good first day. She’s had a good first whole week and is now completely exhausted! I look forward to reading your ‘show’ post. I do love a good produce show. Well done to all the prize winners in the family!